HISTORY: Before the present day 600 ft. bulk freighters all shipping was carried on schooners. 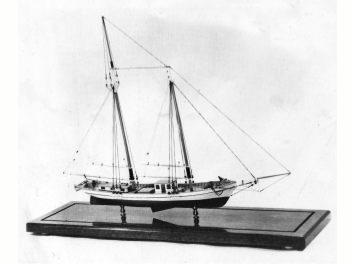 The first distinctive lake schooners were the shoal draft, centerboard, “clipper” type vessels introduced by William Bates, of Manitowoc, Wisconsin in 1851-52. While on the stocks, the Challenge raised many questions from other local builders, but after her launch she proved to be one of the great success stories, so much so that larger versions were introduced such as the “Clipper City” and the “Montowoc.” For many years the two masted clipper schooner monopolized the lakes trades until they grew so large it was necessary to rig them with three or four masts.  Overall Length: 16 1/2"
• Hull Length: 11 1/2"